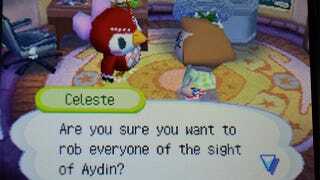 If you've ever played an Animal Crossing game, you've surely done it at least once: name something, or somewhere, after a friend or loved one. It seems a good fit, bringing the real world into your clockwork virtual one, but that door swings both ways. What seems cute or appropriate when things are going well with someone can sour your game if things go bad. Take poor Julia here. She named a constellation after Aydin, which is about the most romantic thing a girl can do. But when they broke up, well, she had to do what had to be done. Not that Celeste is making it any easier. She is in fact making things brutally difficult.